Wow okay yeah, I realize my title is a mouthful. 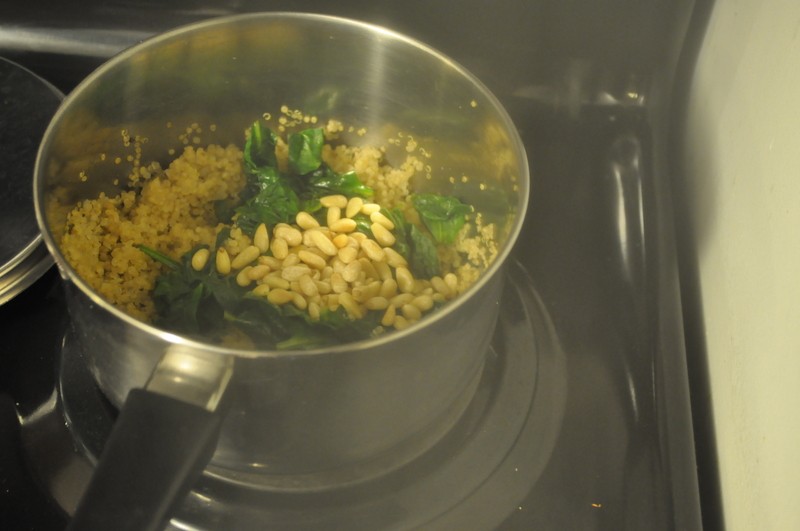 I didn’t know what else to call it to capture the true essence of the recipe, okaaaay? Basically, I saw this recipe a while ago and I thought it looked new and exciting. Who doesn’t love lasagna? It’s cheesy, saucy, pasta-y, veggie goodness all baked into one dish. If it wasn’t all gone by now (we only had one slice left from a fairly hefty casserole dish and I ate it the next night…yes, it was that yummy) I would definitely be eating some as I type. I have a certain friend who, for one reason or another, will not accept that I am, in fact, a decent cook. This dinner was an attempt to change that. My lasagna resulted in some compliments from some of my toughest critics! Try it, it’s delish. 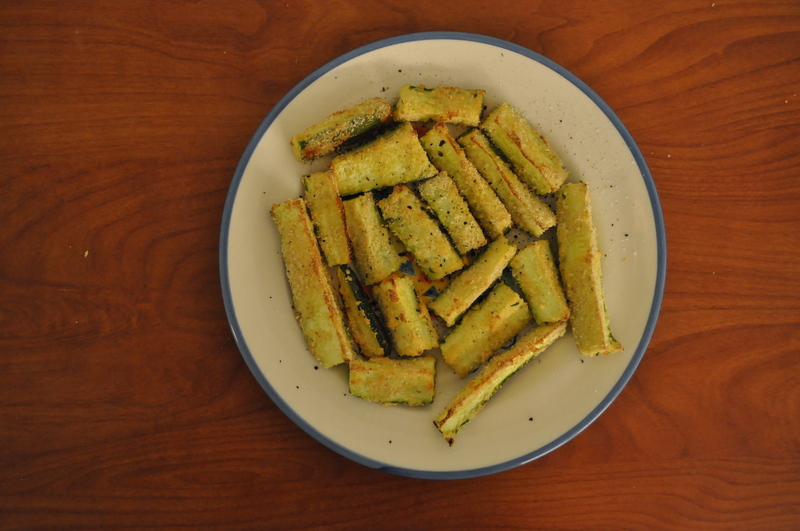 First and foremost, coat your sliced zucchini lightly in olive oil and cook on an outdoor grill. Next, make the sauce by heating the butter in a saucepan on medium until melted, mixing in the flour until combined, then adding the milk and whisking until the mixture thickens (it took me about 6-7 minutes). 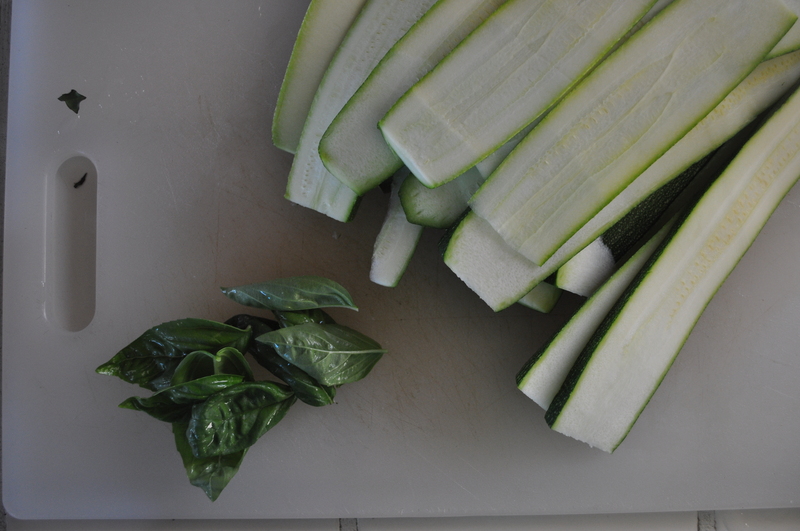 Once thick, stir in the ricotta, basil, and lemon juice and season with salt and pepper to taste. Set this aside. Preheat the oven to 350 and begin to layer your lasagna! I used a 9×13 casserole dish. 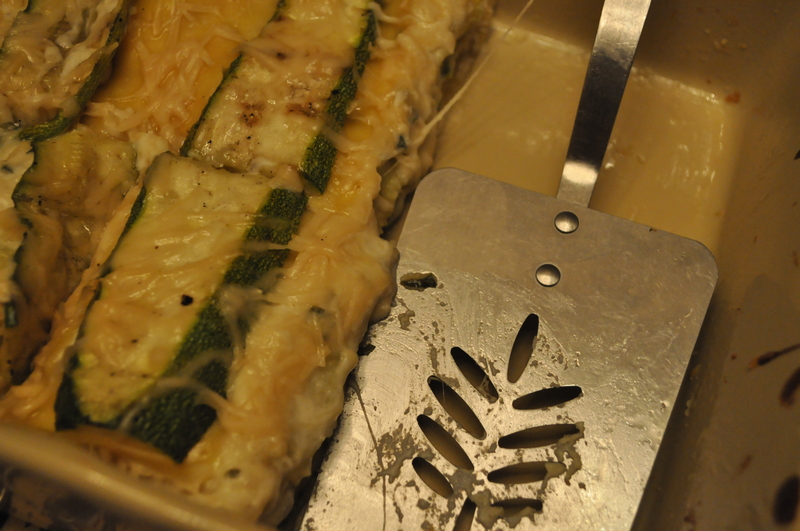 Start with a layer of sauce, then noodles, then zucchini, then cheese and repeat. Don’t overlap anything! It’s quite alright if the layers aren’t perfect. 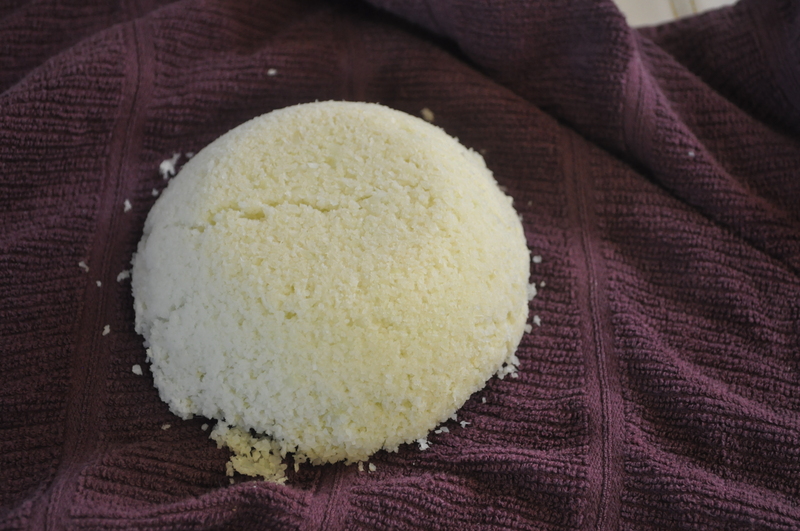 Once you’re done layering, finish the top off with sauce and parmesan and stick it in the oven for about 25-30 minutes until the cheese on top is nicely bubbly. Let it sit for 10 minutes before you eat it (the absolute worst part of making any dish, I know). 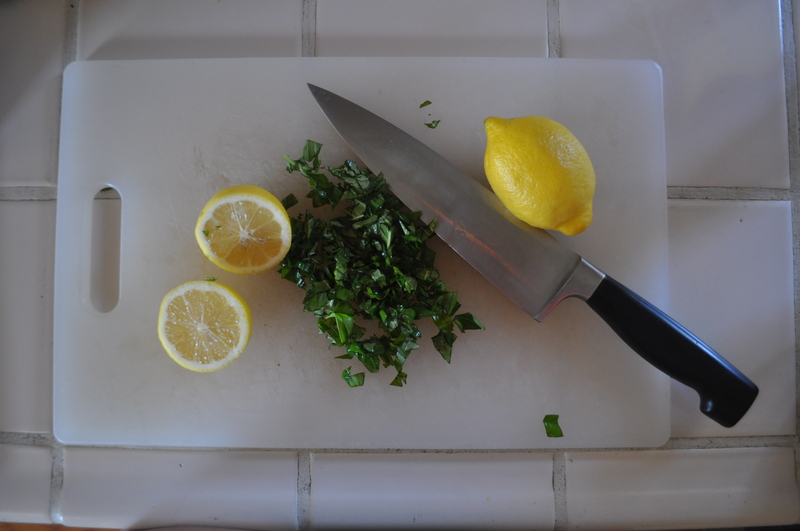 I paired this with some chicken breasts that I marinated in olive oil, lemon juice, fresh basil, and salt and pepper and grilled and it was a perfect pair. My friends enjoyed their dinner, I enjoyed eating it as much (if not more) than I enjoyed making it, and all in all this was a success. If you’re a “traditional” lasagna fan, I suggest you give this a try! 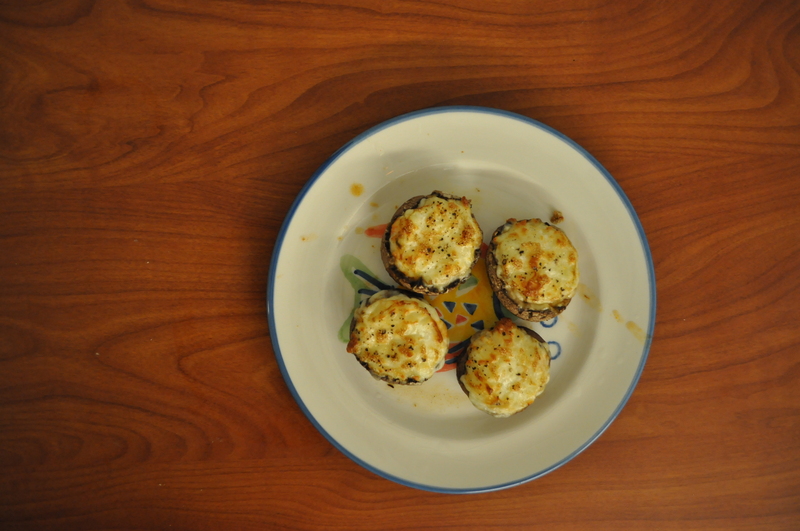 Categories: Dinner | Tags: dinner, lasagna, vegetarian, zucchini | Permalink. Apparently I love veggie things lately. Let’s be honest, I love veggie things always. Veggies are great. And I’ve been really craving pizza lately too. I eat a ton of pizza when I’m in New York (which probably contributes to the noticeable decline in health I experience vs. when I’m home…oops), and I haven’t had any in ages. My family never eats pizza. With the exception of my teenage brother who eats anything and everything he wants, we are super health-conscious in my house. As delicious as pizza is, it is disturbingly unhealthy, I will admit. Although every once in a while, I encourage you to get a real, hefty, doughy slice of pizza loaded up with goodies, this is a nice option for when you’re craving pizza but wanting healthy. So naturally when I saw this recipe on Pinterest, I was excited to try it. 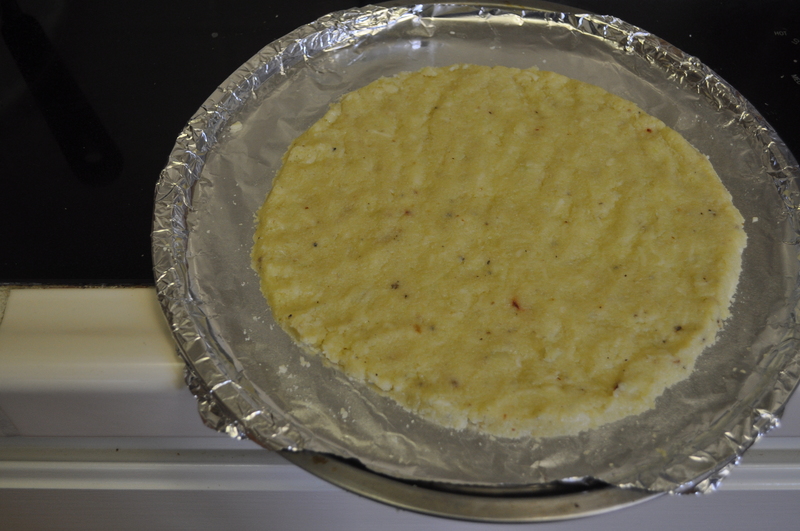 So the super sneaky thing about this pizza is…the dough is made out of cauliflower! I wasn’t joking when I said it was veggie pizza. Heh. Yeah alright I am so not funny. Okaaay I know this sounds kinda questionable…I’m not the hugest fan of cauliflower (the smell scares me), but in this context, it didn’t bother me at all. Quite the opposite, in fact. Although it wasn’t quite as satisfying as a bigger-than-your-face slice of New York pizza smothered in buffalo sauce and bleu cheese (hnnnnng), it did the trick for my pizza craving, aaand it was parents-approved. Win, win! 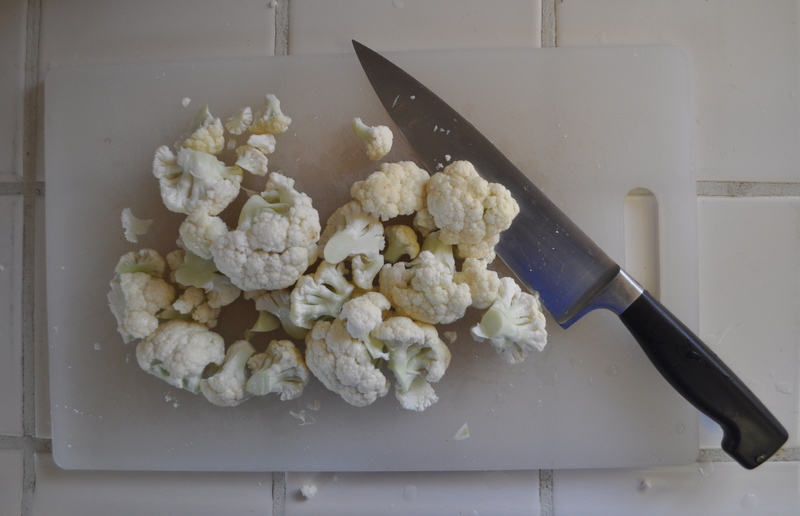 Wash your cauliflower and cut it into florets. Throw these in a food processor in little batches at a time and pulse until the cauliflower is chopped up enough so that it looks like little grains of rice. Put your “rice” in a microwave-safe bowl, cover it and microwave on high for 7 minutes so that it’s nicely steamed and no longer has that funky cauliflower smell. Dump your “rice” into a thin dish towel and (no, I am not kidding), squeeze the hell out of it. I mean it; squeeze like there’s no tomorrow. Get all of your frustration out on this stuff (I know I did). 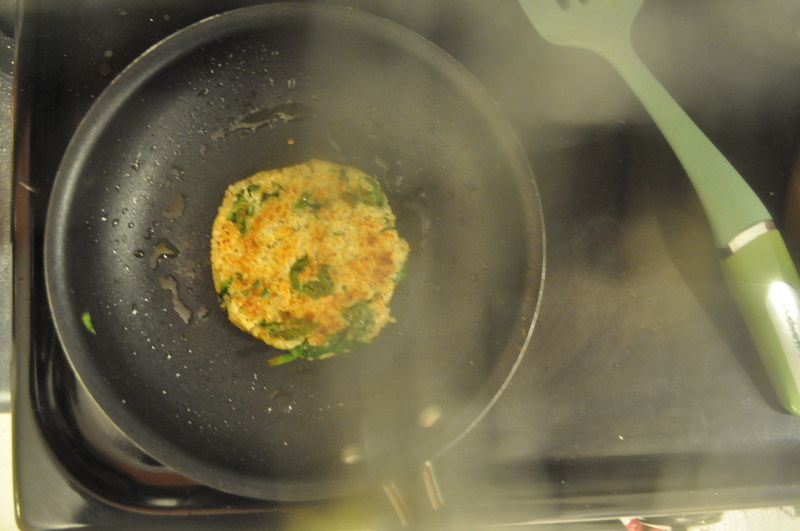 Once it’s properly squeezed, dump it back into a bowl and stir in the egg, cheese and seasoning until properly mixed. This is your dough! 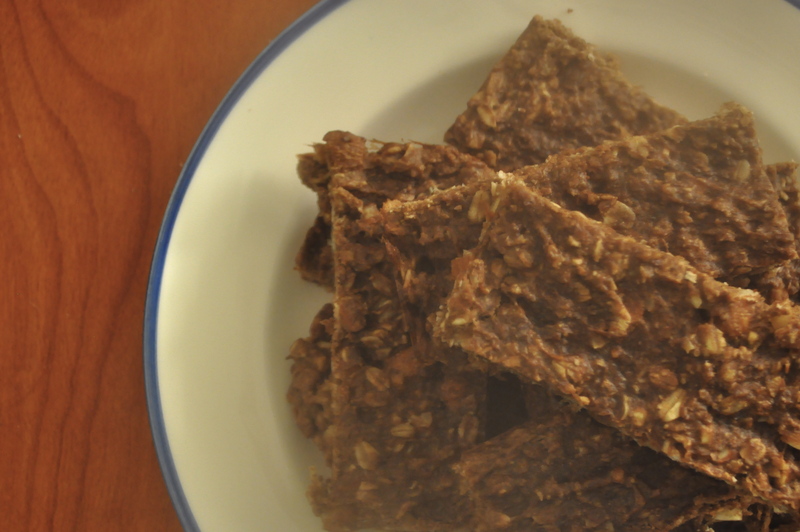 Spread it out as thick/thin as you’d like (I like mine super thin) on a parchment paper lined baking sheet. Please please use parchment paper. Or grease it or something. I used tin foil because I didn’t have any parchment paper and had to practically peel pizza-slice-shaped pieces of foil off the bottom of each slice. No fun. Stick just your crust in the oven for about 15 minutes until it starts to get lightly browned and crispy. Here’s your crust! 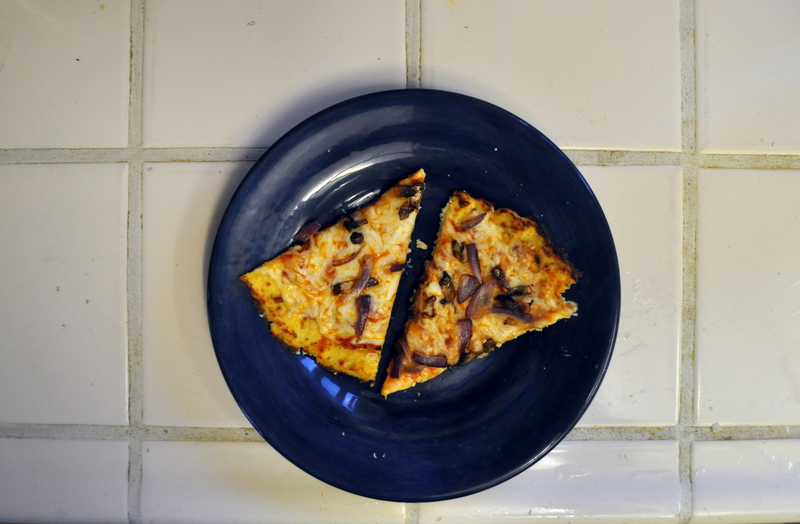 Now turn off your oven and turn on your broiler for the final phase of veggie-pizza-making. Then comes the fun part! Toppings! For this, I just sauteed about 1/4 c. of thinly sliced mushrooms and 1/4 c. thinly sliced red onions with 1 clove of chopped garlic and about 1 tbsp. olive oil on medium for about 2 minutes. 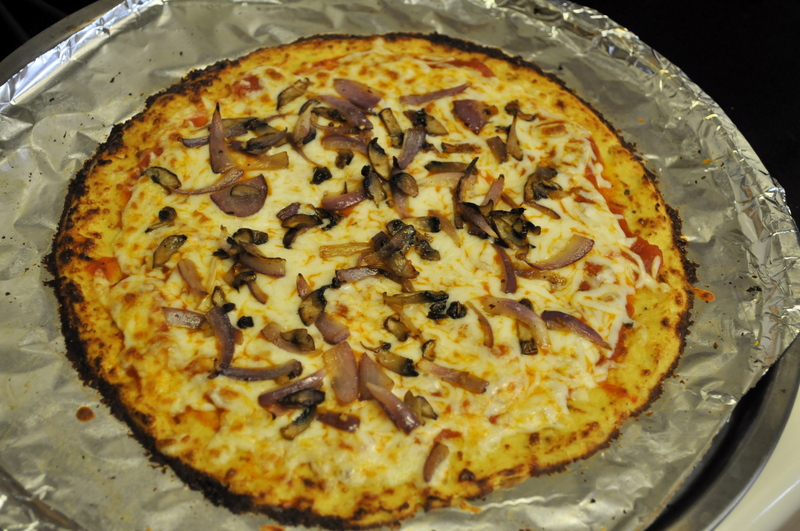 I spread some pizza sauce on the finished crust, sprinkled some mozzarella, and put my mushrooms and onions on top, then stuck it in the oven and broiled it for just a couple of minutes until the cheese was nice and bubbly. Remove, slice, and enjoy! Munch on, health-conscious pizza lovers. 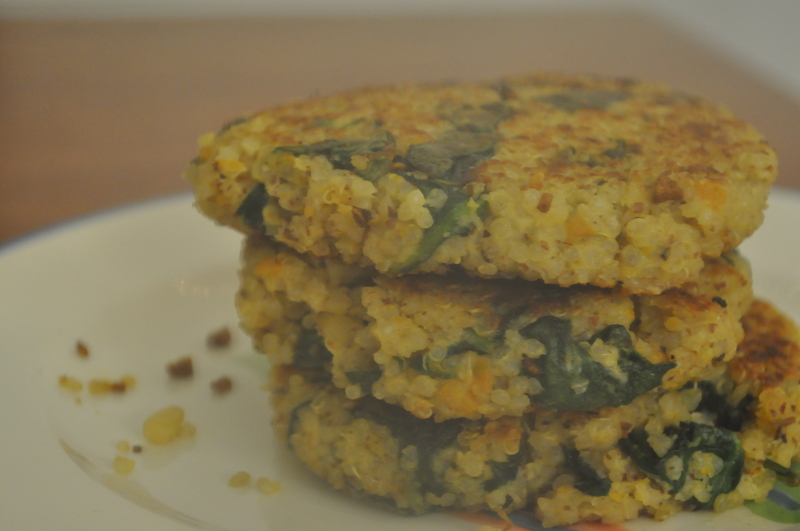 Categories: Dinner | Tags: cauliflower, dinner, pizza, vegetarian, veggie | Permalink. Instead of a batter-y breakfast, I opted for an eggy one. I kept hearing people talk about/seeing recipes pop up on pinterest for egg bakes, and since I’d never made one before, I thought why not. It looked easy enough. 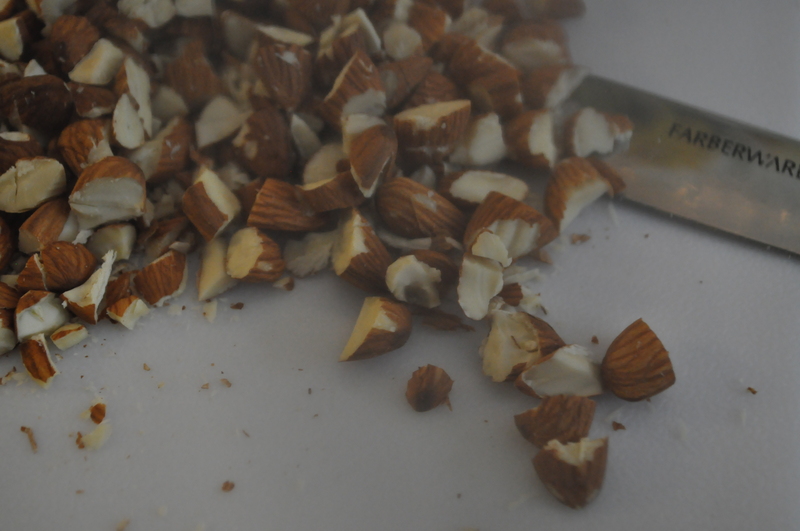 Turns out it was extremely easy as well as delicious and oh so satisfying. As I sit here typing this, I am, in fact, eating the one remaining slice with half an avocado mashed on top for breakfast and I am overcome with breakfast happiness. Not only is it delicious, it’s good for you! 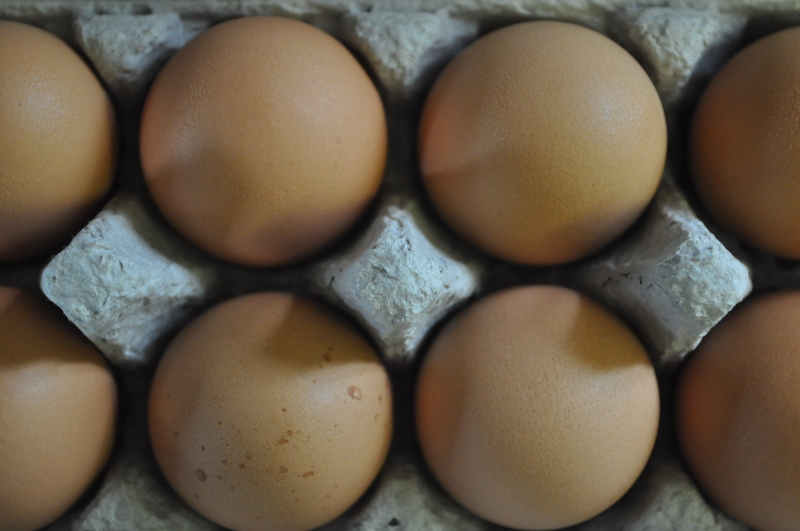 Eggs are pretty much the best thing in the world for you so if you don’t like them, you’re really missing out. 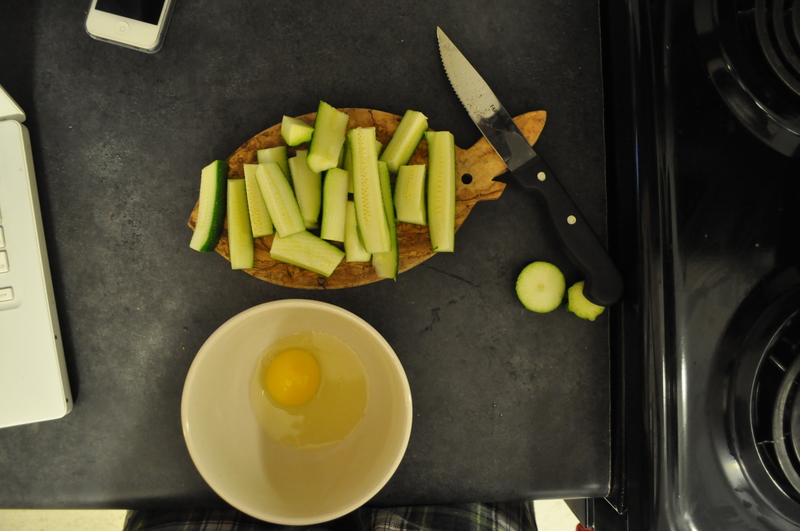 Eat eggs. Do it. Preheat the oven to 375. 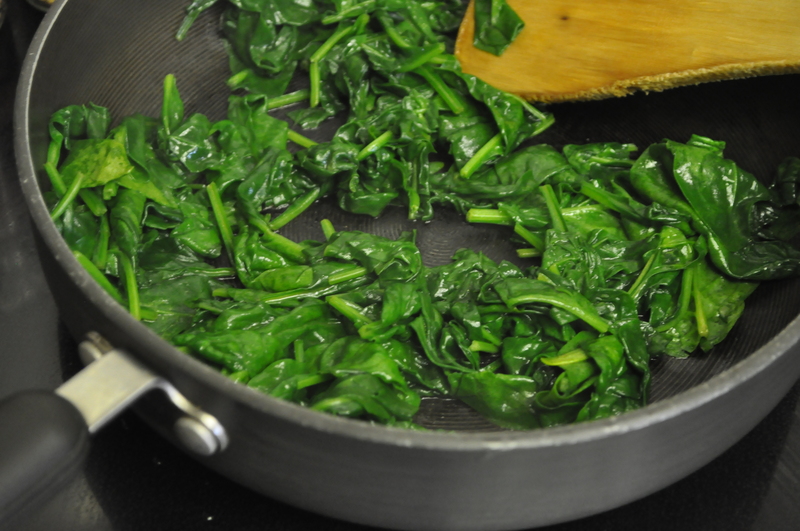 Cook the spinach and olive oil in a skillet on medium heat until it’s wilted; about 2 minutes. 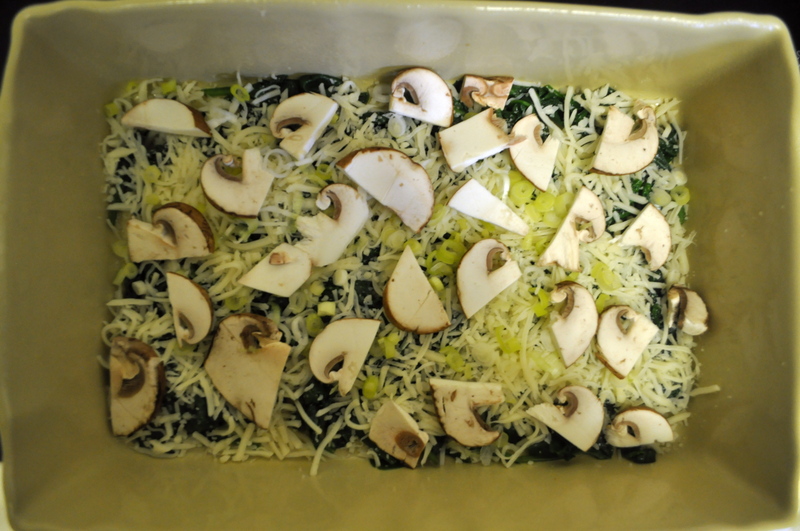 Transfer the cooked spinach to a lightly greased casserole dish (I used a 9×13″ one, but you can use a slightly smaller one if you have it on hand/if you want your egg bake a little thicker) and spread the cheese and other chopped veggies on top. Scramble the eggs in a bowl with the milk (I always scramble eggs with milk; I find it makes them fluffier and more delicious. Picked this trick up from my mama) and season them with salt/pepper. I used about 1/2 tsp. Lawry’s seasoned salt and 1/2 tsp. pepper…Lawry’s on eggs is my weakness. Ugh, yum. Pour the egg mixture on top of the veggies and gently mix together with a fork to make sure the egg is evenly distributed. 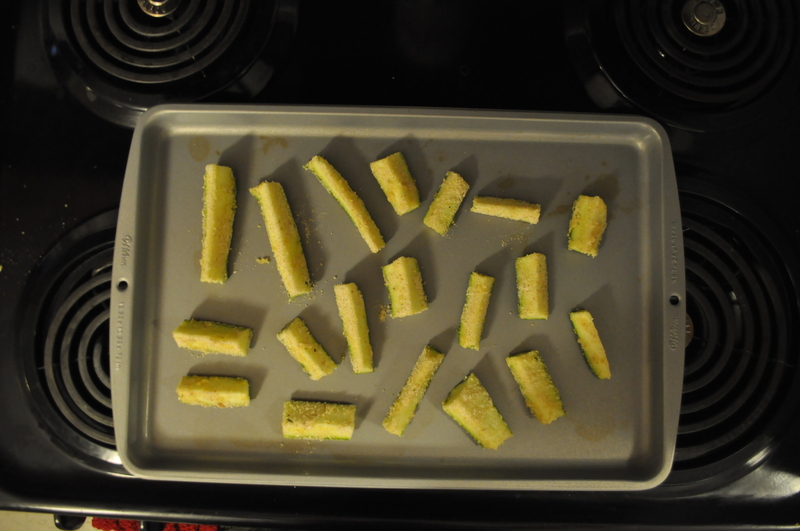 Stick it in the oven for about 35 minutes until the edges are lightly brown and there ya go! I ate mine with some Trade Joe’s Jalapeño Pepper Sauce on top, which was fabulous. I will definitely be making this again; it was a nice alternative to the usual “chicken and side dishes” dinner. 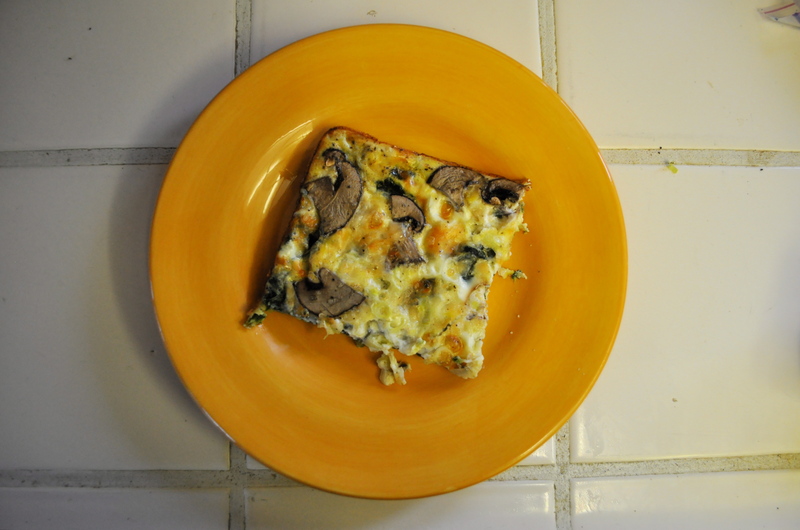 Categories: Breakfast | Tags: breakfast, cheese, egg, egg bake, mushroom, onion, spinach, vegetarian | Permalink.